Top Elf is a fun adventure due to generous helpings of suspense and mystery sprinkled throughout this very Christmas-y book set at The North Pole. The story of two elf best friends during their quest in The Santa Trials has loads of heart-pounding action as well as actual heart. Huett has cleverly hidden tidbits of strong positive messages throughout this tale that young readers will absorb subconsciously (like supporting your friends and being kind). The writing is tight and the exploits seriously exciting. This book is by our very own CALEB HUETT!! It is the literal definition of heart-warming, and is the first middle grade book I've read (since I was in middle school myself) that's made me laugh out loud. Huett weaves together old legends, engaging quips, and refreshing lessons in an all together fascinating Christmas tapestry. He world-builds like he's been doing it for centuries, and won't ever leave you behind floundering in the details. This is a book I want to recommend to all my twenty-something year old friends (and not just to be ironic), because it gave me all the plot satisfaction found in a book for older readers, while letting me enjoy the hilarity and adorableness of a typical middle-grade novel. I read this book in March and let me tell you -- I've never felt more Christmas-y in my life. Oh, Caleb Zane Huett! Your debut has officially made it onto my list of favorite things, right up there with Barefoot Contessa and videos of talking cats. Much like the film, Elf, it subverted my expectations in the most satisfying ways and made me belly-laugh; all the while, it warmed my soul. Emphasizing a range of diverse abilities as a culture's strength, and friendship as a saving grace, Top Elf is a bright bright blaze of optimism and encouragement, and it is a joy to behold. I cannot wait to recommend it. Move over Elf-on-the-Shelf, a more modern Christmas star is born! 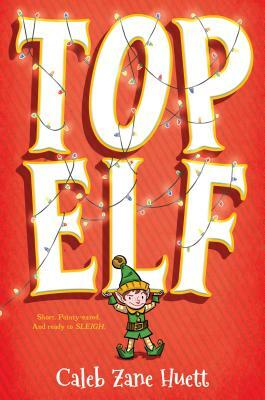 Top Elf is a magical new work of “list-erature” for middle grades from a clever and dynamic young author. Caleb Zane Huett has created a kind spirited and pun-loving hero in protagonist Ollie Gnome. Twelve year old Ollie finds himself among a diverse crew of contestants in a sometimes dangerous competition to become the next Santa. Rollicking adventure ensues. You will find yourself reading on the edge of your seat to see what comes next. Along the way, some hard lessons are learned and lasting friendships are forged. Sprinkled with fairy dust, goodness, and powdered sugar, the humor in Top Elf is infectious. You will be smitten with Huett’s gift for word play. Read Top Elf before it hits the big screen. This book has family blockbuster written all over it. Top Elf is a zany, heart-warming, adventurous Christmas extravaganza. Huett's imagination for Christmas-y in-jokes is endless, and his ability to create sincere, dynamic characters knows no bounds. So, don your Santa hats, and get ready for: a terrifying Frosty the Snowman, reindeer nuggets ("chicken nuggets shaped like reindeer, not made of reindeer, obviously"), science!, The Gingerbread Woman ("She was known throughout the North Pole for being exactly who you call when your gingerbread house is a fixer-upper"), true friendship, and lots of crying. It's the North Pole like you've never seen it before. Get HORSE . . . get set . . . HORSE! Ollie and Celia think they know what the life of an elf is supposed to be like: Make toys. Help Santa. Make more toys. Help Santa. Try out a new ice-cream flavor. Help Santa. But then Santa rocks the North Pole with a surprise announcement! He's decided this is going to be his last year in the Big Red Suit--and instead of letting his oldest son, the unfortunately named Klaus Claus, take over, he's opening up the job to any kid who wants to apply--Claus or elf. Caleb Zane Huett is a playwright, indie bookseller, and undercover reindeer. He's a graduate of the University of Georgia, and he's really good at video games. One time he won a funnel cake doing the Macarena to Christmas music at a rodeo. Top Elf is his debut novel. He lives in Athens, Georgia, and you can find him at calebzanehuett.com.